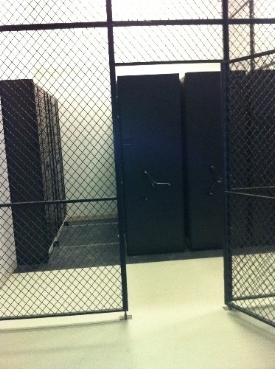 Woven Wire panels are constructed from 10 gauge diamond pattern wire with 8 gauge welded wire cages and partitions also available. Section 10605 and meet or exceed Woven Wire Products Association's recommendation. 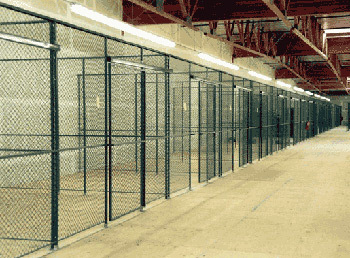 Woven Wire panels are utilized in armories and warehouses on military bases and law enforcement facilities, and in businesses looking for secure fenced in cages. 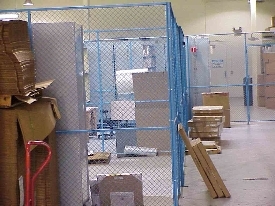 Wire partitions and panels are also used in offices to secure spaces requiring additional security such as supply storage, sensitive item storage and many other applications. 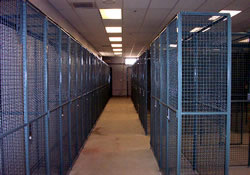 MTM offers turnkey projects from concept to Design, Engineering, Manufacturing and Installation. Options from vertical partitions, two sided, three sided and full sided cages with either hinged or sliding doors allow secure spaces to be created within an existing footprint. Constructed with heavy duty #10 gauge wire diameter (woven wire), intercrimped securely woven in diamond patterns to provide rigidity, stability and strength and also available with 8 gauge welded wire, with each cross section welded together for added rigidity.